The Rock Kings are an all original Rock Band from Baltimore, Md. featuring the music of Singer/Songwriter/Guitarist Rick Nomad. 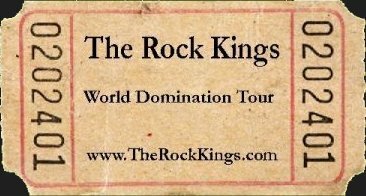 The Rock Kings are coming to a town near you! 09/28/13 The Circuit - Essex, MD. 09/14/13 Brass Monkey Saloon - Baltimore, MD. 06/18/13 The Whiskey - Annapolis, MD. 05/13/13 The Whiskey - Annapolis, MD. 04/21/13 Fish Head Cantina - Arbutus, MD. 12/22/12 Brass Monkey Saloon - Baltimore, MD. 09/26/12 The Whiskey - Annapolis, MD. 06/26/12 Fish Head Cantina - Arbutus, MD. 05/22/12 Fish Head Cantina - Arbutus, MD. 03/17/12 Brass Monkey - Baltimore, MD. 03/16/12 Surf City - Perry Hall, MD. 03/09/12 Fish Head Cantina - Arbutus, MD. 02/07/12 Fish Head Cantina - Arbutus, MD. 02/01/12 Diamondback Tavern - Ellicott City, MD. 01/26/12 Old Bowie Town Grille - Bowie, MD. 01/18/12 Lauraville House - Baltimore, MD. 12/03/11 Brass Monkey - Baltimore, MD. 11/29/11 Fish Head Cantina - Arbutus, MD. 11/08/11 Fish Head Cantina - Arbutus, MD. 10/28/11 Brass Monkey - Baltimore, MD. 10/25/11 Fish Head Cantina - Arbutus, MD. 09/23/11 Brass Monkey - Baltimore, MD. 09/13/11 Fish Head Cantina - Arbutus, MD. 08/31/11 Perry's - Odenton, Md. 08/30/11 Fish Head Cantina - Arbutus, MD. 08/23/11 Fish Head Cantina - Arbutus, MD. 08/18/11 Surf City - Perry Hall, MD. 08/13/11 The Sinix - Essex, MD. 08/02/11 Fish Head Cantina - Arbutus, MD. 06/05/11 The Whiskey - Annapolis, Md. 05/19/11 Sapphire Sports Bar - Laurel, Md. 05/15/11 The Quarter - Baltimore, Md. 05/09/11 The Fire Club - Philadelphia, Pa.
05/06/11 Perry's - Odenton, Md. 04/30/11 The Whiskey - Annapolis, Md. 03/30/11 Perry's - Odenton, Md. 03/24/11 Overlea Station - Baltimore, Md. 03/08/11 Judges Bench - Ellicott City, Md. 02/15/11 Woodstock Inn - Woodstock Md. 02/08/11 Gunpowder Lodge - Kingsville, Md. 02/03/11 Longshots - Abingdon, Md. 01/29/11 Perry's - Odenton, Md. 01/25/11 Judges Bench - Ellicott City, Md. 01/19/11 Cacao Lane - Ellicott City, Md. 11/11/10 The 8X10 - Baltimore, Md. 11/09/10 The Whiskey - Annapolis, Md. 10/27/10 Cacao Lane - Ellicott City, Md. 09/14/10 The Whiskey - Annapolis, Md. 08/18/10 The 8X10 - Baltimore, Md. 06/15/10 The 8X10 - Baltimore, Md. 06/02/10 CC's Tavern - Essex, Md.